Thanksgiving if 5 days away and if a big, juicy ham is on the menu, here’s a delicious way to prepare it so it’s perfect for your holiday supper or brunch! For this recipe I scored the ham in diagonal cuts that form diamond shapes and inserted whole cloves where the cuts intersect, giving the ham just a hint of spice! The glaze, made with apple cider vinegar, brown mustard and cola, makes it even yummier! Of course, since you didn’t put the cherries on this ham–we have the perfect excuse to add them into the meal on the bottom (or is it the top?) of a mouthwatering Pineapple Upside Down Cake! This year, ham it up with family and friends! 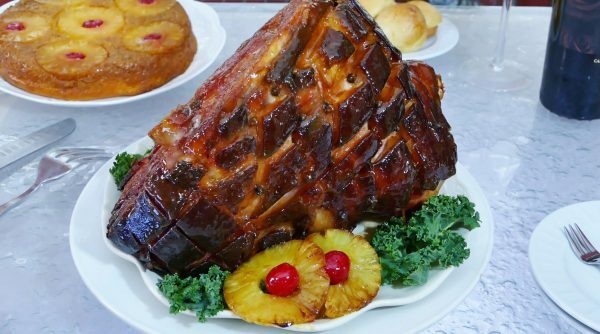 Check out my Video for Glazed Ham with Pineapple Upside Down Cake Here! Preheat the oven to 325 degrees. Score the ham about 1/8 deep on the diagonal in both directions to form a diamond shaped pattern. Place cloves where the cuts intersect. Place the ham in a large foil lined roasting pan with a rack and bake for 1 1/2 hours. Meanwhile make the glaze. In a small saucepan, whisk together brown sugar, mustard, vinegar and cola until mixture is bubbly. Cook on medium high heat until glaze has thickened, about 15 minutes or longer if needed. After 1 1/2 hours of baking time, brush glaze over ham and return to oven, repeating several times until ham reaches 160 degrees. Preheat oven to 350 degrees. Grease an 8 x 8 inch cake pan. Prepare cake batter according to package instructions. Note: If using orange juice for added flavor, reduce the amount of water called for by 1/2 cup. In a small skillet on medium low heat, melt together butter and brown sugar, stirring quickly to combine. Spread evenly over bottom of the greased cake pan. Arranged sliced pineapple on top of brown sugar and add cherries in the holes of the pineapple slices. Pour cake batter over top. Bake for 25-30 minutes or until toothpick comes up clean. Let cool for 5 minutes. Gently loosen the edges and turn upside down onto a serving plate. Makes 1 large or 4-5 mini cakes. Most hams are FULLY-COOKED and just need to be reheated. The package will give cooking instructions and cook times, but the general rule is 7 minutes per pound.